NK Fencing is pleased to have been able to assist the BAM McCann JV with the installation of a new acoustic barrier along the Magherafelt Bypass. 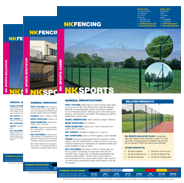 NK Fencing is the leading perimeter and security fencing manufacturer in Ireland. Specialists in Ibex, Sports and Palisade fencing.